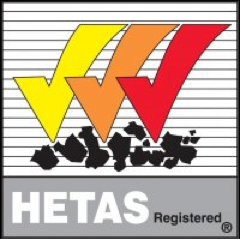 HETAS is the official body recognised by the Government to approve biomass and solid fuel domestic heating appliances, fuels and services including the registration of competent installers and servicing businesses. Chimserv is registered for the installation of dry appliances, service and maintenance of appliances, installation of twin walled flexible flue liners and the installation of insulated twin wall systems (metal). The Company Registration number is 2068 and the Engineer Registration number is 12043. In England and Wales most installations of solid fuel, wood and biomass appliances and systems are subject to the requirements of Building Regulations. These regulations are a must and need to be notified to the relevant Local Authority Building Control department by law. HETAS registered installers can self certificate their work thus avoiding the need for costly and time consuming Building Notice applications to the local Building Control department. 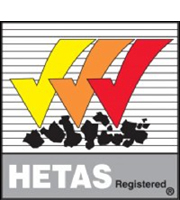 HETAS registered installers will provide the customer with a certificate of compliance upon completition of the installation and send a copy to HETAS for onward notification to the local authority. The certificate of compliance issued by the installer is an important record demonstrating that the work was carried out legally and in accordance with the relevant Building Regualtions and by a trained and competent installer of a registered business. When consumers sell their property, the information about work carried out under Building Regulations is required and used by solicitors on their enquiry forms. Failure to demonstrate compliant work can adversely affect the sale of the property.